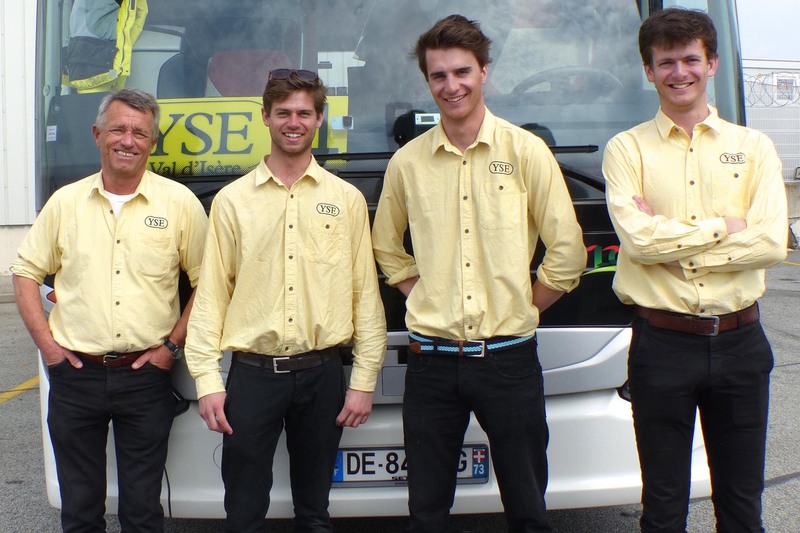 In a former life, the YS of YSE had to limit the travel chaos of a major ski tour operator, while the E had to answer the hundreds of complaints each week about it! So when we set up YSE, hassle-free transport was one of our main aims. On winter Saturdays, the airports, skies and roads are gridlocked, while the pistes are practically empty. On Sundays, travel is a joy, but the slopes are at their busiest. So we chose to travel on Sundays. And with just one flight serving only Val d’Isère, we can guarantee no waiting around for other aircraft or resorts. We constantly look for ways to make our travel arrangements even more painless. Every year we consider different airports, airlines and schedules. We’ve thought about trains, but the Eurostar is slower and more expensive than our flight, and either gets you to Val d’Isère too early to get into your chalet or too late to sort out equipment. In the end, we have stuck with chartering our own Boeing from the same excellent airline, in spite of its changing its name from Britannia to Thomsonfly and now TUI. Our flight takes off at 9.50am, and is one of the the last flights which have not already done a rotation and picked up delays. Check-in opens at 7am for those who want to beat the queues. We have also stayed with Gatwick, which is still the most convenient airport for the majority of our guests, and has made huge efforts to reduce congestion over the years. Nowadays there is surprisingly little queueing and waiting, particularly on winter Sundays. And new this year we are delighted to be landing at Lyon, which is a beautiful, ultra-modern airport which almost no other ski charter flights use. We are huge fans of tiny Grenoble, but over the last two years its increased traffic and the much slower passport controls for British travellers entering the Schengen Zone have totally saturated it. At Lyon our coaches park very near to both check-in and baggage retrieval, passport control is automated, security is slick, there are proper shops and restaurants, and even the loos are modern and spotless! We never underestimate the complications of travelling in the winter, be they fog at Gatwick, ice on the wings, snow in the Alps, avalanches across the road or whatever. But we think that going via Lyon is going to save our guests up to two hours on arrival, and quite a bit of time at departure. The transfer time is approximately 2 hours 45 minutes – the same as from Geneva or Grenoble. Most of the transfer is on smooth and uncongested motorways and expressways, so we expect to reach Val d’Isère just five hours after take-off from Gatwick. You’d only do the journey a few minutes faster with a private jet and a taxi! Ski schools and shops are uncrowded when we arrive, and stay open until at least 7.30pm. Meals are not provided on the YSE flights, although drinks and snacks can be purchased on board or after landing. If the passengers wish to, we can stop any coach mid-journey at a motorway services to stock up on provisions, though it is hardly necessary, since a full tea (tea, coffee, hot chocolate, cake, bread and jam) will be waiting in the chalet when you reach Val d’Isère at about 4pm French time. Going home, our flight takes off at 1.45pm French time and lands at 2.25pm UK time. This means the first of our staggered coaches leaves Val d’Isère at around 8am, and the last coach leaves an hour later, so nobody has to queue at check-in for more than a few minutes. We are rarely delayed, and do not cost into our holidays any food or drink to placate passengers, but please note that we automatically cover each guest for up to £500-worth of extra expenses incurred by us on their behalf should additional travel or accommodation be necessary: Insurance, YSE Automatic Cover.